This Holiday Caravan is 39 feet long and 12 feet wide. Pemberton Mystique Caravan. 3 bedrooms. 2 twin bedded rooms and 1 master bedroom with en suite shower toilet and sink unit. Further bathroom with bath, toilet and sink. Fully equipped kitchen with oven, hob, microwave and fridge freezer. Formal dining area seating six with glass panelled dresser. Lounge area with white Adams feature fireplace and flame effect fire. Large screen TV and freeview with DVD player. Floor length drapes and comfortable velour sofas and coffee table. The caravan has full central heating and double glazing and is therefore able to rent all year round. Patio decking to 2 aspects with patio furniture and a paved courtyard with further patio furniture ideal for barbecues. Adjacent parking for 1 vehicle and additional parking close by. Lydstep Park is close to the coastal paths and very near to all local beaches set within the stunning Pembrokeshire National Park. It operates a boat and jetski launching service which can be booked on site. The Club House boasts excellent food and wines with live entertainment and children's club. Indoor swimming Pool and games area, Satellite TV, restaurants and bars. There is a laundry and grocery store on site. 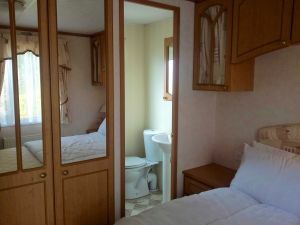 This listing for a privately owned static caravan rental has been viewed 24568 times.